Today, Moab singletrack is abundant — mountain bikers visiting Moab have so many singletrack trails to choose from, they could conceivably ride a different area each day for an entire week without repeating a thing. But that was not always the case. Prior to the completion in May 2007 of the Baby Steps mountain bike trail in the area now known as North Klondike, mountain bikers in Moab mainly rode two-track jeep roads. There were a few exceptions — the bottom of Porcupine Rim Trail through Jackass Canyon, The Portal Trail off Poison Spider Mesa — but for the most part, Moab’s early fame in the 90’s as a Mountain Bike Mecca was largely due to The Slickrock Trail (originally pioneered in the ‘60s for motorcycles) and Moab’s plethora of insanely rugged two-track jeep roads left over from the Uranium Boom that ended in the early 1980’s. By the early 2000’s, other mountain bike destinations, like neighboring Fruita, CO, had become famous for their newly developed singletrack trails, and leaders of Moab’s mountain bike community knew they had to do something to keep up. But doing so would not be easy because, at that time, Moab was at the center of a Perfect Storm of conflict over competing uses for public land, especially regarding recreation. The Bureau of Land Management (BLM) administers much of the public land around Moab. In the early 2000’s, BLM’s Moab Field Office was just beginning a process to update its Resource Management Plan, which had not been revised since long before Moab’s resurgence as a recreational hot spot. Previously, BLM’s primary concerns involved regulating oil and gas development and cattle ranching. Unlike the National Park Service and US Forest Service, the BLM was relatively new to managing recreation. That fact, combined with the sagebrush rebellion-inspired debate over the fate of Utah’s federal lands, made any thought of creating brand new trails, or converting motorized routes into non-motorized routes, difficult, to say the least. Previous community discussions on the subject were known to get heated. Happily for Moab and the mountain biking world, cooler heads prevailed. In December of 1999, with leadership from the Grand County Council and the City of Moab, and representation from all the relevant public land agencies and recreational user groups (motorized and non-motorized,) a new committee was created and started holding meetings open to the public. It was called Trail Mix. Though many groups and individuals have taken the lead on different trails over the years, it’s a safe bet that without Trail Mix acting as a moderating influence, facilitating compromise between the many different factions and coordinating the many moving parts, Moab would not have the world-class system of singletrack trails it does today. With the completion May 11 of Rodeo, a new singletrack loop south of the Horsethief Campground near Canyonlands National Park, Trail Mix celebrated the completion of over 150 miles of singletrack trails in the Moab area, fulfilling one of its original goals. In 1999, Kim Schappert was a newly elected member of the Grand County Council and one of a number of people who helped get Trail Mix off the ground. She said Trail Mix owes its success to patience and persistence. In the beginning, she said, the mountain bike community had to build trust with the agencies. “We were the new kids on the block,” she said. “We had to prove ourselves.” And building that trust took a lot of time. In fact, after its inception, Trail Mix would go on to hold its regular public meetings for seven years (working on a variety of mixed-use and paved bike path projects, and developing a county-wide master trail plan) before its first mountain bike singletrack trail came ever into existence. That first trail, appropriately named Baby Steps (in the North Klondike area) was completed in May 2007. Schappert said Baby Steps came about due to a call she got one day from then BLM Realty Specialist Russ Von Koch, one of the early supporters of Trail Mix. “Russ had all the maps in his office,” she recalled, “and he said, ‘Hey, let’s go check this out.’ Russ and I went out and rode it.” And together, they led the effort to get it built. 2007 was a watershed year for Trail Mix. It included the submission for public comment of the Non-Motorized Trail Mix Master Plan (approved in April 2008,) completion of phase one of the Moab Brands Trail Area with the opening of Bar-M Loop, followed closely by development of Circle-O, Rockin’-A and Bar-B trails. After that, it was as if the singletrack “flood gates” were opened. 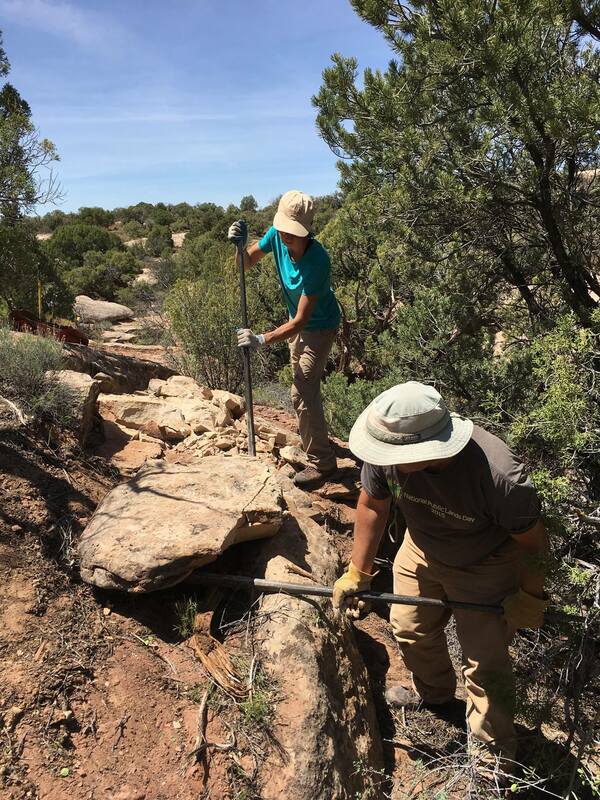 Escott’s involvement in Moab trail development dates back to 2009 and his work with then City of Moab Community Development Director David Olsen, on the Pipe Dream Trail. 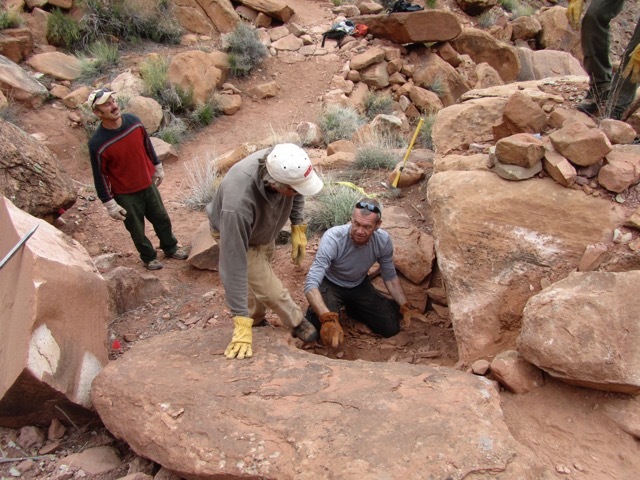 For much of the past 8 years, Escott has worked for Trail Mix designing, building and coordinating volunteers on many of Moab’s singletrack trails. He estimates that if Grand County had had to pay 100% of the cost of all its trail development work, it would have cost $5.5 million dollars. As it was, they got it for around $400,000, he said. Now, after 10 years of working together with Trail Mix, Moab BLM is recognized as “the gold standard for recreation management,” Escott said. Another major factor contributing to Trail Mix’s success was the City of Moab — much of that through Olsen. As a mountain bike enthusiast and community planner for the city he was in the perfect position to spearhead many of Moab’s trail projects, often acting as planner and fundraiser. He first became involved with Trail Mix while being interviewed on a local radio show hosted by a local mountain biker. He recalls doing the initial scouting work on the Circle-O and Rockin’ A routes, which largely traverse open sandstone “slickrock.” “I marked it with Gorilla Tape,” he said. “They said to mark it with rocks, but there weren’t any. I also tried chalk, but it washed away in the rain.” Soon, his trail marking method evolved, and by the time the route was officially approved and was ready for permanent markings, he had configured a small paint roller to leave mountain bike “tire marks” by taping strips of gorilla tape over it like a stencil. Even so, some trail ideas took much longer than others. Olsen recalls one of his biggest passions was an area now known as Navajo Rocks, but back then he was calling it Round Mounds. He says he fought for Round Mounds for 5 years, and got pushback even from within Trail Mix itself. But eventually, Trail Mix and the BLM relented, and Navajo Rocks (named for the geologic layer prominent in the area) was developed in 2014 and completed in 2015. Olsen agrees with Schappert that patience and persistence were the key factors in Trail Mix’s success. 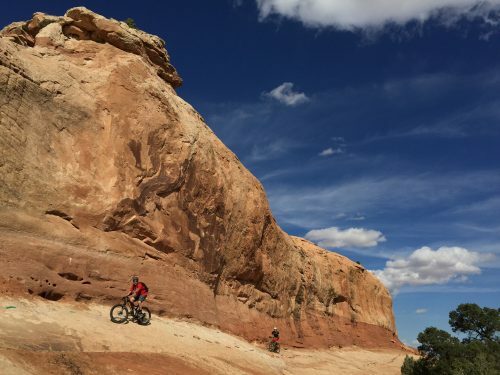 There was a steep learning curve for everyone involved, and at each phase of Moab’s singletrack development, they had to take baby steps before they could take Mega Steps. 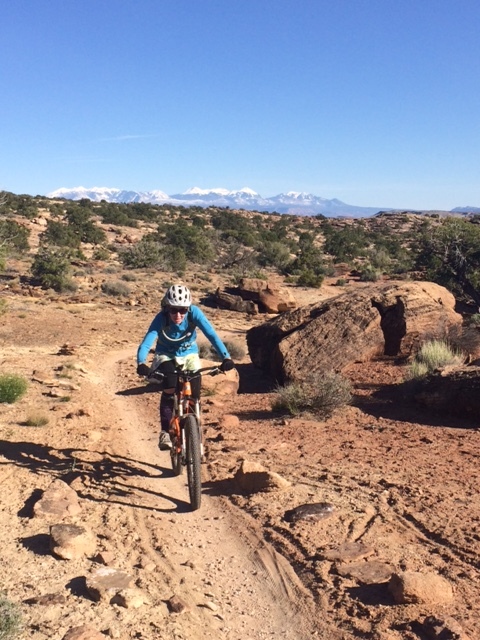 November 20 | Winter Mountain Biking in Moab? February 16 | DIY Ride or Guided Mountain Bike Tour? March 31 | Best Way to See the New Bears Ears National Monument? February 8 | Oregon Timber Trail: cross entire state 55% singletrack!